Explanation: December's Full Moon phase occurred near perigee, the closest point in its orbit around our fair planet. Big and bright, the fully illuminated lunar disk sets over rugged mountains in this early morningscape from Turin, Italy. 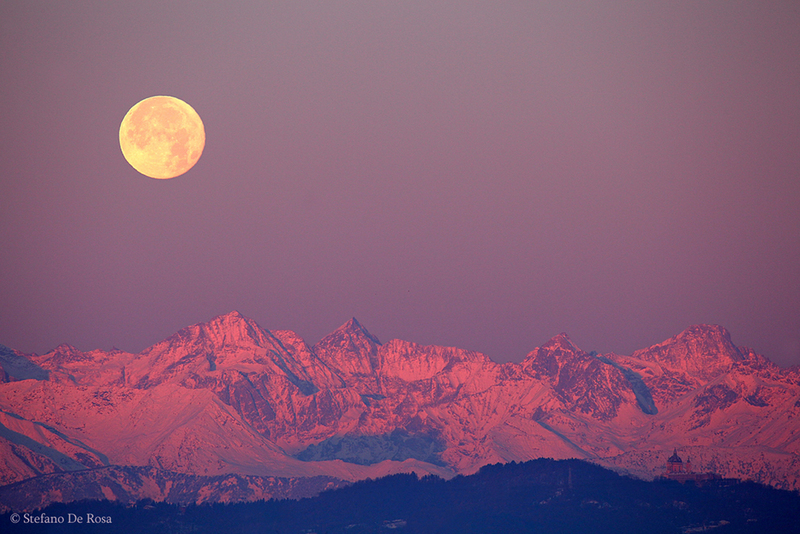 Captured just before sunrise on the opposite horizon, scattered sunlight near the edge of Earth's shadow provides the beautiful reddish glow of the alpine peaks. Hills in the foreground are still in shadow. But the scattered sunlight just illuminates the dome and towers of Turin's historic Basilica of Superga on a hilltop near the lower right in the telephoto frame.